The ingredients list of the Cetaphil Gentle Skin Cleanser actually is pretty short and simple. There's Purified Water, emollients (Cetyl Alcohol, Stearyl Alcohol) and a humectant (Propylene Glycol), both of which give the product moisturizing properties, the surfactant which actually removes the dirt from your skin (Sodium Lauryl Sulphate), and the preservatives to prevent the product from going bad (Methyl Hydroxybenzoate, Propyl Hydroxybenzoate, Butyl Hydroxybenzoate). The interesting thing about this formulation is that it is very emollient and humectant heavy - Cetyl Alcohol and Propylene Glycol are second and third on the ingredients list respectively, being present at higher amounts than the surfactant, and Stearyl Alcohol is fifth. So, as you can easily conclude, this is a cleanser that will be pretty moisturizing and non-drying, due to the high concentrations of emollients and humectants. I know some people may have concerns over Sodium Lauryl Sulphate being drying on the skin, and while by itself in high concentrations it can potentially be drying to some skin types, in this formula, it appears to be present in fairly low doses, combined with a large amount of moisturizing ingredients. So I'm not worried that the formula will be drying at all. 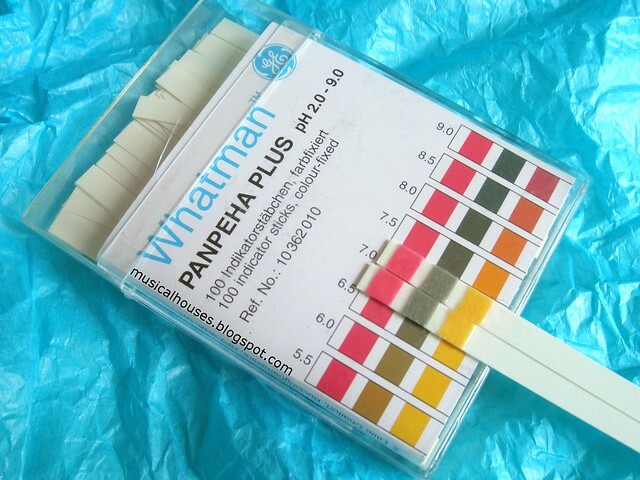 To confirm this, I tested the pH of the cleanser! Often, a high pH (meaning that the cleanser is very alkaline) is often associated with very drying or stripping cleansers. Our skin's pH is pH5.5, or slightly acidic, and ideally, we want to be as close to that number as possible. Pure water has a pH of 7.0, and is considered neutral (neither alkaline nor acidic), so any pH value larger than 7.0 would be alkaline, and the larger it is, the more alkaline it is, which, in the case of a cleanser, means it is likely to be more drying as well. In this case, we have a pretty good reading of pH6.5, both when the cleanser is tested alone, and when it is tested mixed with some tap water (to mimic how it might be used in an everyday setting when you wash your face). This means it is a non-alkaline cleanser, and yes, is indeed formulated to be quite mild and non-drying. Now that we've looked at the ingredients, how does it perform? Well, as you can see from the photo above, the cleanser has a pretty creamy texture. I remember when I first used the Gentle Skin Cleanser, I thought that the texture was more similar to that of a moisturizer than a cleanser! It does feel nice and moisturizing on the skin, due to the high levels of humectants and emollients, and does indeed live up to its reputation of being a gentle cleanser. It also rinses off cleanly, although it doesn't lather up and generate much foam, if any. Basically I use a pump of this, spread it over my face, massage it around for a bit (and don't worry if it doesn't foam), and then rinse it off. I do have pretty acne-prone skin (as I'm sure you know if you've been reading my blog for awhile), and I don't find this irritating or drying to my skin at all. I also really appreciate that it is fragrance free, and the short ingredients list also means that this product doesn't have any fragrances or potentially irritating plant oils and the like, too, which is also a plus. Perhaps the only downside to this product is that because it is pretty gentle, it's not going to function as a makeup remover for heavy makeup, like some stronger cleansers do. It does remove some light makeup, but if you have a full face of makeup on, I would suggest that you use a separate makeup remover before using this cleanser. I personally get the best use out of this as a post-makeup-remover cleanser, to make sure everything is really cleaned from my skin, and as a morning cleanser, when I have no makeup on my skin but want to wash off any oils that may have been secreted during the night. So, would I recommend the Cetaphil Gentle Skin Cleanser? Yes I would! I've been using this product for perhaps a decade now, and it is one of the staples in my skincare regime, so of course I really like it and think it's a great buy. For an affordable price, you get a well-formulated gentle cleanser that does help to clean the skin, while not stripping it or leaving it feeling tight and dry, and that doesn't aggravate skin allergies or sensitivities. The only downside is the need for a separate makeup remover if you use makeup, but I really appreciate having a great basic cleanser to fall back on. The Bottom Line: Cetaphil's Gentle Skin Cleanser is an affordable, no-frills product that lives up to its claim as a gentle cleanser, with moisturizing properties. Thanks for the review! I'm a little confused-- isn't the majority of the major ingredients alcohols? I'm not an anti-alcohol person. I just assumed the benefits of -OH was to help penetrate ingredients and is only okay to have them in low doses. So wouldn't this formula be more drying...? @Muser: Thanks for your comment! You've confused alcohol with fatty alcohols. Although lots of people I've seen often get the two mixed up because they both have the "alcohol" word in the name, they are totally different types of ingredients, with different molecular structures and properties. The alcohol you're thinking of often appears on ingredients lists as "alcohol", "isopropyl alcohol" or "alcohol denat." in ingredients lists, and is a liquid with a small molecular structure, that can penetrate the upper layers of the skin, and is often used to help thin out the formula or enhance delivery of other active ingredients. It can indeed be potentially drying to the skin in large amounts, so you're not wrong about the properties of plain old alcohol. 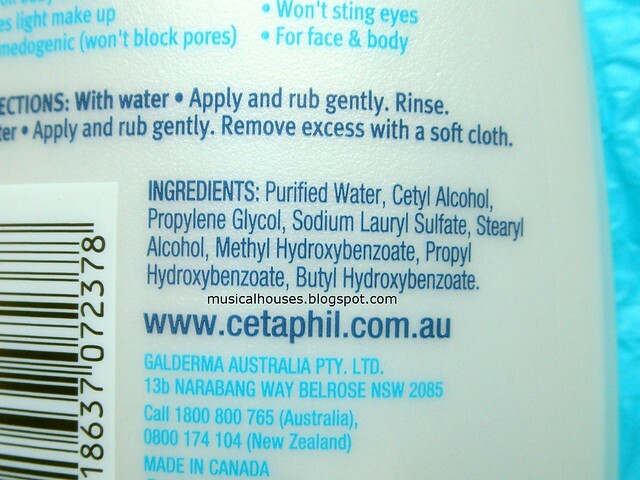 But, the ingredients present in the Cetaphil cleanser are not that kind of alcohol. They are two types of fatty alcohols, Cetyl Alcohol and Stearyl Alcohol. These are much larger molecules that are derived from fatty acids, and are a solid with a waxy feel. When applied to skin, they sit on top of the skin and function as an emollient or a barrier ingredient, which helps to moisturize the skin and prevent further water loss. So you'll often see these ingredients quite commonly used in moisturizers and body lotions, too. So that's why the Cetaphil cleanser is not drying - the alcohols it contains are actually fatty alcohols, which are a different type of ingredient altogether. Hope this helps! Great review! Now I know and understand why many prefer this product. Ooh, glad to hear that the sulfate in this won't harm the skin! Thank you for the review! Do you happen to know how this cleanser compares to the CeraVe hydrating cleanser? @Anonymous: I think ultimately, both are good cleansers geared towards sensitive skin, and for that purpose, both get the job done. But there are some differences, which might mean that some people will prefer one over the other. For example the CeraVe has a much longer ingredients list than the Cetaphil, so people who like a simple ingredients list might prefer the Cetaphil. On the other hand, there are some additional ingredients in the Cerave that the Cetaphil doesn't have (most notably the Ceramides and Phytosphingophine) and some people may like that, but others may feel that it's not necessary in what is ultimately a wash-off product. To be honest I've never tried the Cerave before, and I'm quite used to the Cetaphil cleanser, so I can't directly compare, but based on the ingredients list, that's what I can gather. I hope my response helps somewhat! Hi! I want to ask something. 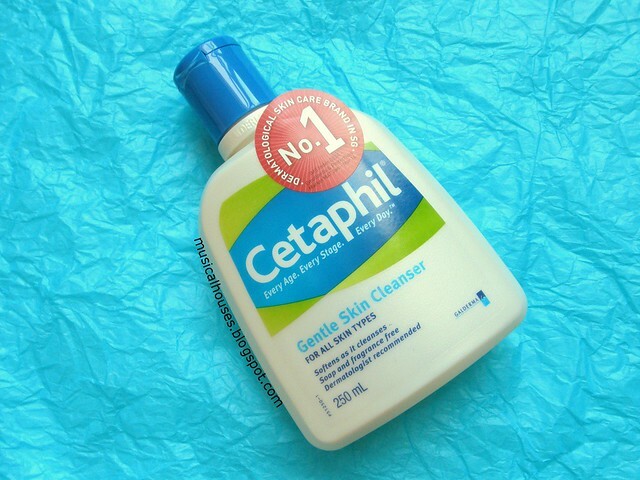 Is it normal for someone having some pimples on the skin when using cetaphill cleanser? And what is healing crisis? @Anonymous: Are you asking if Cetaphil cleanser can cause breakouts? The cleanser shouldn't be causing breakouts. But from your short statement it's hard to tell what is. 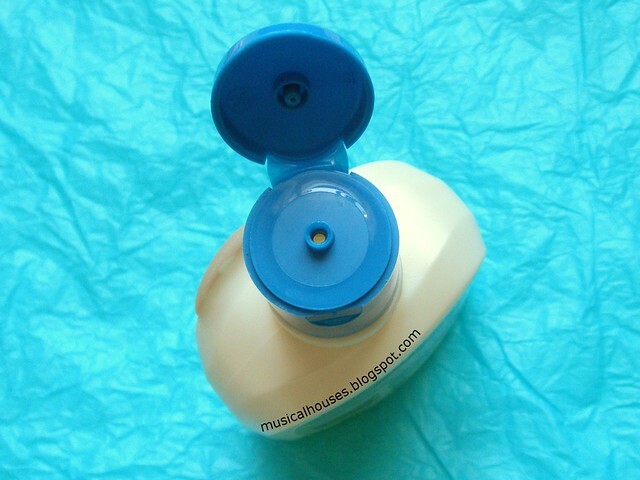 However some suggestions for using Cetaphil are: If you're wearing makeup and using the Cetaphil cleanser to remove it, then it's possible that it might not be strong enough to remove all your makeup, in which case you might be better off using a separate makeup remover, and then following up with the Cetaphil. Also, if you have very oily skin (the "normal" Cetaphil is probably best for dry skin) then you might need the oily skin version of Cetaphil, or another stronger cleanser. Hope this helps! Seems to me like Cetaphil is a prettyy crappy cleanser - SLS, parabens and wax, basically. How do i use it on face?